House of worship or simply house? 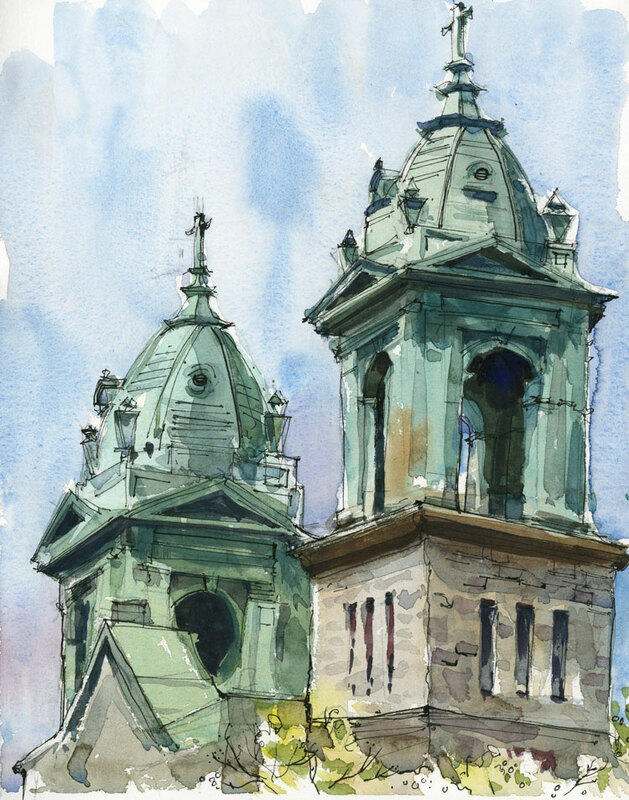 I finally had a chance today to sketch this church on Blvd. St. Laurent at the entrance to Little Italy. As I often do when I arrive home, I went straight to Google to find out the name of it because it didn’t seem to be posted out front. It took a little digging until I realized it’s a church no more. In fact Église St-Jean-de-la-Croix was converted to condos sometime in the 2000s. If I had been sitting right across from it I probably would have seen the telltale signs — lots of windows, balconies, maybe even lawn chairs and planters — but I was parked a little ways down the street and didn’t see the lower part of the building at all. I’d love to live in an old church….but it is sad! Hi Dee. It’s interesting to see the next comment from Kathleen who lives in the building. Not sad at all, as it turns out. And now I know the name of the condo building. I am one of the residents of this building. “Sad” was seeing the church empty and derelict for a decade before it was developed as a condo. Now it is full of life again, inhabited by people of all faiths and ages, who take pride in the building and maintain it beautifully, though various volunteer efforts. Beautiful drawing of condo St. Jean Delacroix. Thanks so much for writing Kathleen. It’s great to hear from someone who lives in the building. And now I know the name of it too. Not only is it a beautiful piece of Montreal history, but what a location you have. Across from the park, a few blocks from the market and only a few steps to an espresso at Café Italia. Lucky you.